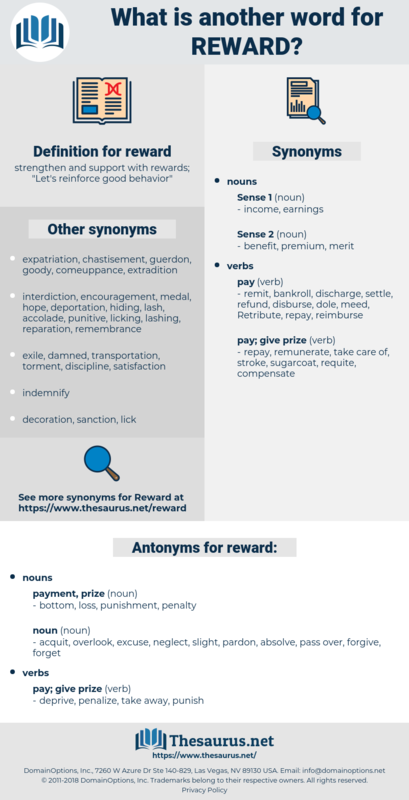 What is another word for reward? 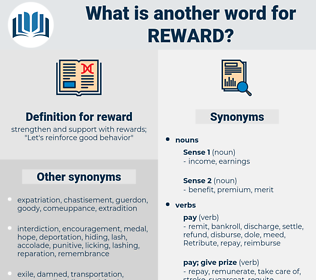 strengthen and support with rewards; " Let's reinforce good behavior"
Activities, remuneration, payoff, gratification, recognition, retribution, pays, honorarium, honoraria, payment, prize, wage, pay, reimbursement, appreciation. reciprocate, repay, encourage, acknowledge, pay. acquit, overlook, excuse, neglect, slight, pardon, absolve, pass over, forgive, forget. deprive, penalize, take away, punish. It means, I know, that for a time - I promise you that it shall be only for a time - you must lose your friends, but the cause is great enough, and it should be within our power to reward you later on. After all, he concluded, it wasn't the reward of the game but the playing of it that counted. reedy, reheat, rat-a-tat, read, rid, rawhide, 23rd, rewrite, red heat, rut, rarity, red haw, rat-tat, ready, rete, rude, 33rd, riot, rad, red-eye, red tide, read-out, radiate, root out, reata, reid, raid, root, redo, rood, 3rd, rat, rheidae, red, rate, ratite, redwood, ride out, ratitae, redheaded, red tai, rat-a-tat-tat, rare earth, rot, radio, raw data, rooted, ret, rota, roth, ratty, rowdy, redeye, reed, rearward, readout, rotted, rudd, rout, retie, ride away, rod, rotated, ratio, red-hot, rodeo, riyadh, road, roadway, red hot, rutty, 43rd, riata, rotate, reread, rite, ruta, reword, rit., Rede, raw wood, ready-to-eat, rote, RHD, rout out, ride, rutted, ruddy, raita, redhead, reit, route, ruth. guerdon, blood money, premium, meed, bounty, honorarium.